"There seems to be no sign of intelligent life anywhere." I always have been. Sometimes I think I was born too early, and that a universe full of spaceships, megacities and oddly dressed people would have been as natural to me a Sarlacc is to a pit. What has become a regular vice in my fondness for the spectacle of spaceship battles, is Star Realms. I have easily played into the triple digits of games by now. On my flight to Cairns to visit some family I took only my phone with the Star Realms app installed and it kept me well and truly content. I was imagining the plane was a spaceship hurtling through hyperspace. Which was awesome until my girlfriend asked me to stop making the whooshing noises. I’m doing something a little different here at The Goof Review today. Normally the games I review are either base games or expansions. This game actually fits both of these categories. You can play this game either by itself or combine it with Star Realms and other expansions of its kin. With an expansion game I’d review it as a modification of the base game. But today I’m going to treat it as a base game and then talk about when you combine it with Star Realms. Clearly not enough game companies got the memo with how I structure my reviews and had to make things complicated for me. 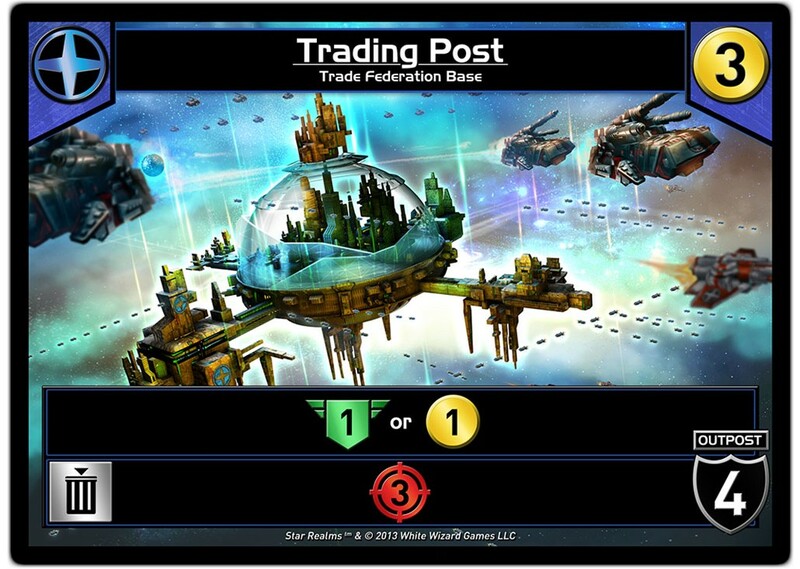 Star Realms: Colony Wars plays identically to the base game. So you’re not experiencing a change in the Matrix, there are bound to be a few similarities. The deckbuilding mechanics of the game are central to victory, and you feel like there’s so many options on most turns. It encourages you to deckbuild. If you’re sitting there thinking “that’s an odd point, a deckbuilder should always encourage you to build” then firstly… wow, can’t believe I can read your mind. Let me try that again. Oh gross. You’re weird. Although I like that you’re reading this review in Morgan Freeman’s voice. Secondly, I’d like to direct you HERE where you can see an example of when deckbuilders don’t encourage deckbulding (it’s as bad as it sounds). There’s something to be said for games that are simple to learn and difficult to master. It creates this awesome situation where you have such a large amount of people to play with, and people who are willing to learn because it really comes down to knowing seven symbols and what they mean, and four of those symbols do the same type of thing. Learning this game is really quite intuitive. 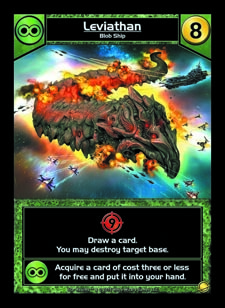 I find that the ships in this game, compared to the original Star Realms, seem to be a bit more indirect about what they’re attempting to accomplish, and each faction is more firmly cemented in its particular strengths and weaknesses. There were some cards in this game that were fascinating to add, not necessarily stronger than the original cards but did one or two things that were heavily placed in their faction’s aims, like ‘Storage Silo’ which gave two consistent authority (health) every turn or ‘The Oracle’ that let you scrap a card from your hand to thin your deck of the junk leftover from as you were building it. When you combine the two games, you get a huge selection in ships and bases. This is an awesome factor as it adds an epic amount of replayability and having to adapt your deck to what cards are available for purchase. This plays into an issue I had with the first game, which is that you can play a game and never see half the cards. Having said that, this game comes with a lot cheaper ways to scrap cards out of the trade row. I consider this a huge improvement on the base game. Having both Star Realms and Star Realms: Colony Wars means you can have up to four people playing at the same time. I loved this idea when I first heard about it. And it’s fun. A word of caution, I wouldn’t play free-for-all. Play where you can only attack left or right, or a team battle. Because having three people target one until they’re down isn’t fun, and it messes with the balance a lot. You end up with people not attacking others because they feel bad, not because they’re making tactical decisions about what’s in their best interests. If you have the restrictions in place as a rule, I find the game a lot more fun (and not just because I don’t like getting picked on…mum…everyone’s being mean to me!). I love combining the two games so much that I’ve got them permanently mixed together. A friend of mine said he enjoys playing the game with just Colony Wars and he’s even got two of the same packs and combined them together. I think I’d miss the basic ships too much. But what has always been an interesting element to White Wizard Games is that they really let you pick how you want to play the game, and this is an idea I can get behind. Because the best person to determine how you have fun is you. The theme is heavy in this game. You’re amassing a fleet of ships, bases and outposts while your opponent does the same. What I love is that you’re fighting over authority in the galaxy. As new bases get established, you need bigger and better ships to keep destroying them, and more outposts to defend them. You start to make concessions about what ships you are willing to make room for in your fleet, and then you’re scrapping the jank out to make it more of a specialised force. Without combining it with the base game I feel like you’re missing some really key ships and bases from the factions. Where originally I saw this as a flaw because I felt like missing out on thematic bases and ships like ‘Blob World’, ‘Trading Post’ and ‘Blob Destroyer’ was missing something so central to different factions’ identities. But, the more I thought about what this game was supposed to be demonstrating, the more I actually didn’t mind. It says it all in the title, “Colony Wars”. You’re not supposed to be playing with the central worlds, you’re supposed to be playing the ships out in the fringes of space, adapting their ships to colonise and explore new worlds. And when you combine the games together, you’re getting more of the whole picture. As I said in the Star Realms review, there is a beautiful synergy between the theme and mechanics, and it fits the deckbuilding genre so nicely that it’s easy to find yourself needing some kind of rehab after playing a game or two. One thing I can guarantee you is that you will get your money worth with this game. I got my copy for $25 (although you can get your copy of Star Realms free if you enter the competition), and even if you don’t play it as much as I do (you will), even only a handful of games (pffft) will see an overall value. I think I like the artwork in this game even more then Star Realms, even though it is consistent. It’s like they took risks and differentiated the factions even more in style, and boy did they succeed. I mean…that Leviathan card? D.A.M.N. The box is… well, it’s crap. There’s no way to get around that. It fell apart in no time at all. I actually went out and purchased the official bigger box just to throw the box away. And I never throw any of my game stuff away. Even my Arkham Horror boxes…which I have all eight expansions on top of the already component heavy game and store in a separate box – I still lug all the empty boxes around when I move houses. To be fair, White Wizard Games CEO Roberty Dougherty did explain to me that it was done to keep the cost of the game down with the expectation people would store their games in other ways, but I feel like board games are supposed to be stored in the box they came in…just not Arkham Horror. I was super happy with this purchase however. And it came with promo cards! One thing about combining these games though…the damn blue on the back of the cards is different. I can’t be the only one to notice this yeah? There are other small differences to the colour but the blue is really evident to me. I HATE this. I’ve had to go out and buy card sleeves just because it was bothering me so much. Especially early in the game when you might only have one card from Star Realms and another from Colony Wars and you can easily tell what’s coming up. It might not make much of a difference gameplay wise, but it drove me insane. The rulebook in this game is clear, and literally a folded sheet of paper. As I said earlier, the rules are that simple. If you can read the cards, you can pretty much play this game without reading a whole lot of the rules. I still think the Authority cards that you use to track your health are clunky and horrible. Maybe a Star Realms official score tracker sheet of paper with a tiny pencil would be beneficial? The two types of cards that track your “authority” are double sided. They come as 20/10 and 5/1. This is just…really painful. It detracts from the game when you’ve got to flip cards, find others and sort out how to represent your health. Especially when you’ve got limited cards to do it and there’s the chance you’ll both gain more health than your starting value. It’s annoying. Honestly…just use a pen and paper. Just go buy this game. It’s fun. I can’t emphasise this enough. If you’ve dabbled in Magic: The Gathering, if you’ve tried Marvel: Legendary, or even if you’ve tried an abomination of a deckbuilder like Heroes of Metro City, then you owe it to yourself to play a great game like Star Realms: Colony Wars. And if you think you might be interested, enter our competition to win Star Realms and try the game for free. Warp Speed, Mr Sulu. We have us a game to play. 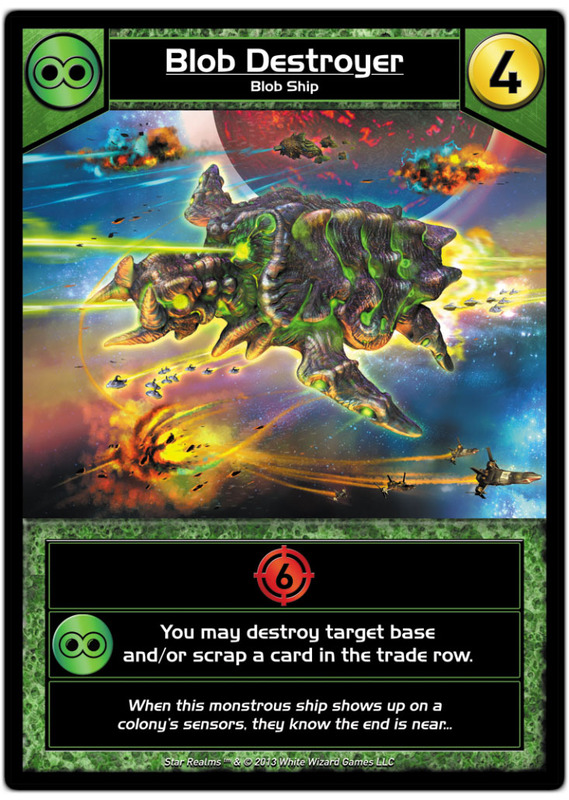 Be the first to comment on "Star Realms: Colony Wars… Warp Speed, Mr Skywalker!"